a device for dispensing liquid in a fine spray; types used include jet and ultrasonic nebulizers. Called also atomizer. small volume nebulizer a pneumatically powered device used to aerosolize medications for delivery to patients. ultrasonic nebulizer an electronic device that generates ultrasound waves that break up water into an aerosol mist. Venturi nebulizer a type of nebulizer used in aerosol therapy. The pressure drop of gas flowing through the venturi mask draws liquid from a capillary tube; as the liquid enters the gas stream it breaks up into a spray of small droplets. A device used to reduce a liquid medication to extremely fine cloudlike particles; useful in delivering medication to deeper parts of the respiratory tract. /neb·u·liz·er/ (neb´u-li″zer) atomizer; a device for throwing a spray. a device for producing a fine spray. Intranasal medications are often administered by a nebulizer. Also called atomizer. A device used to disperse liquid medicine in a mist of extremely fine particles; useful in delivering medicine to the lower respiratory tract; used in biowarfare to disperse toxins or other harmful biologic agents. An aerosol produced by the action of a vibrating ultrasonic transducer under water. A form of inhaler used mainly in the control and treatment of ASTHMA. 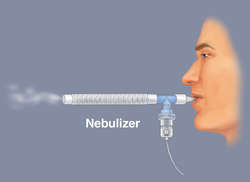 Nebulizers deliver an aerosol of the active drug in water or other vehicle. Some are electrically operated. A device that turns liquid forms of medicine into a fine spray that can be inhaled. A device used to reduce a liquid medication to extremely fine cloudlike particles. an atomizer; a device for creating an aerosol. Though there are local studies on various aspects of asthma, there is no local study published so far comparing the response of nebulised salbutamol alone with combination of ipratropium bromide. The combination of nebulised ipratropium bromide and salbutamol in a child with acute severe asthma exacerbation was associated with significant reduction of clinical asthma score. intravenous Hydrocortisone (1), nebulised Beclomethasone (2) and no steroids, (3). has marketed the nebulised version of colistimethate sodium (Colomycin([R])) for use in cystic fibrosis patients for over 20 years. To evaluate whether nebulised budesonide reduces the duration of exacerbation. One of the studies will take place in Germany, with a nebulised formulation of DX-890 to evaluate the reduction of the concentration of surrogate markers of inflammation, using broncho alvealoar lavage (BAL) as a means of measuring effect. It is a novel inhaled PDE3/PDE4 inhibitor with anti-inflammatory and bronchodilatory properties and is presently developed as a nebulised treatment for acute exacerbations in chronic obstructive pulmonary disease patients in a hospital or home-care setting. Theravance Biopharma, a biopharmaceutical company, has collaborated with United States-based Mylan to jointly develop and commercialise a new investigational once-daily, nebulised, long-acting muscarinic antagonist, (LAMA), TD-4208, it was reported yesterday. Aires' lead product candidate, AIR001, is an intermittently nebulised formulation of nitrite that has orphan drug designation in the US and EU for the treatment of pulmonary arterial hypertension. The company's research and early clinical development senior vice president Mathai Mammen stated that some patients might prefer long-acting medicines delivered in the aqueous nebulised platform over handheld inhalation devices. The study consisted in the administering of nebulised RPL554 as a single dose of 0. In conjunction, Forest Laboratories Europe has marketed a nebulised form of colistimethate sodium, an antibiotic used to treat the principal bacterial infections in cystic fibrosis patients, under the brand name Colomycin, in the UK and Ireland.